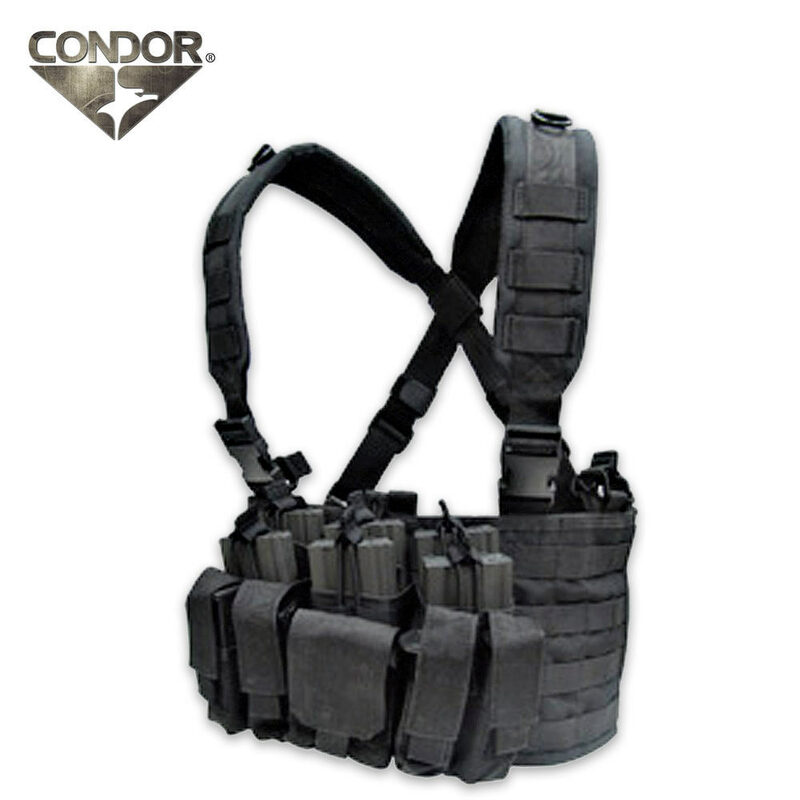 Condor Outdoor Recon Chest Rig | BUDK.com - Knives & Swords At The Lowest Prices! This is a good little chest rig, I picked it up on one of the discount days and got it for just around 45. First off, its got 6 bungee top M4 mag pouches kangarooed by 4 hook'n'loop pistol mag pouches with a double pistol mag pouch in the center. There is room for 2 more AR mags on the very sides, but its not very comfortable with them in place. Its very adjustable for size and girth, but could use a middle of the back support. The reason being, if you have this rig fully loaded you look like you're going to give birth, the rig droops from the weight. The Multicam is good for a Condor product, but is a little lighter shade than my 5.11 pants and my Tru-spec combat shirt. The MOLLE webbing is made of the same material as the rig itself, unlike most tactical gear which uses a nylon webbing of a more OD color, this is both good and bad. The good is that, obviously, its more Multicam, the downside is that the material is folded over itself with makes looping other pouches on a lot more difficult as they tend to get hung up on the snaps. There is an optional Hydro Harness (have yet to see on BudK) that attaches to this for a more full rig look, and allows you to tote a bladder or other gear. Attached a dump pouch and misc pouch on the sides and its good to go. All-in-all, a solid chest rig, and worth at least 45 bucks.